This assignment checks your progress in understanding of the content of the Maintenance Lessons and Workbook. Question 1. What is the most common hazard in the enclosed spaces of a steel ships void compartments? Question 3. Other than suffocation, what is a significant risk within a enclosed engine room. Question 4. Describe the hazards you would anticipate in the enclosed spaces of your vessel during and immediately after refit or restoration. Question 5. 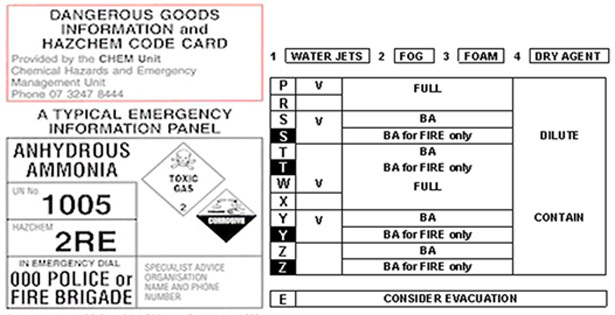 What is a hazardous materials safety data sheet? Question 6. Explain the meaning and purpose of the HAZCHEM Code 2RE on the tank of Anhydrous Ammonia, as below. Question 8. Explain your precautions when stowing corrosives and inflammables in your vessel. Question 9. List three administrative permits/certificates that are required to ensure safe entry to work in the space labelled as below. Question 10. List four personal protective item inclusions to a pre-entry checklist to safely enter to a dust filled enclosed space that contains noisy operational machinery and requires heavy hand tools/equipment. Question 11. Name the essential entry document for works/repairs by a competent person that safely manages cleaning operations, hot works, grinding and sparking, dust producing operations, solvent fumes or otherdangerous operations within a confined space. Question 13. List the personal protective equipment that would be required by statute to enter a confined space (whose atmosphere was insufficient to sustain life) to rescue an unconscious victim that was no longer breathing. Question 14. What rescue equipment would be most useful in recovering the victim from inside the above confined space. Question 15. After the victims rescue, what immediate action could probably save his /her life. Question 16. As a master, list your strategies to limit hazards during routine maintenance on the ship.